This is a film about conviction and commitment; about how Dr. Mukwege’s struggle has lasted for 20 years despite the obstacles thrown in his path and the threats to his life; about how he built a hospital with psychological and legal departments to physically and psychologically heal women, and how he fights on a daily basis alongside these women to put an end to the causes of violence in his country. The film also bears witness to the important role played by those who surround the doctor, above all the women to whom he has dedicated his life, but also his colleagues and his family. Dr. Mukwege is not alone. His strength stems from the people around him. The film travels across Kivu, with its lake and its magnificent landscapes, just as Denis Mukwege travelled as a child with his father, a protestant preacher, on his visits. He is deeply attached to Kivu. Kivu is also the border between Rwanda and Burundi where Denis Mukwege spent part of his youth and where he lived through the ethnic conflicts between Hutu and Tutsi. In April 1994 thousands of Tutsi fled from the genocidal Hutu across this border. Then, in July, thousands of Hutu fled Rwanda across the same border when Paul Kagame came to power. This is what led to the development of the civil wars in Congo that are so atrocious for the civilian populations, particularly the women. It is these conflicts that have led Dr. Mukwege, reluctantly, to become a medical specialist, a gynaecologist, and to vigorously protest against the absence of a political solution to bring an end to these atrocities. The film accompanies Dr. Mukwege, both in the Congo and during his travels abroad. In Panzi hospital, where the Dr. Mukwege is forced to live for security reasons since the attempt made upon his life, we follow his words and those of the women he treats. Abroad, we filmed his crusade to raise the awareness of the international authorities: in New York during his interventions at the United Nations; in Stockholm when he receives the Alternative Nobel Prize; in Washington with Hilary Clinton as she hands him a prize, and in Brussels at the European Parliament for the Sakharov Prize. Based on the doctor’s struggle against the wounds inflicted on the bodies of the raped, impaled women and against the impunity of the criminal authors of these atrocities, we travel back through the constant criss-crossing of his lifeline and the history of a country. The destiny of Dr. Mukwege is part of the broader history of the Congo and the film tells how he was confronted with the reality of the war. Archive images show him in situations clearly linking him to the conflict. These archive images enable us to understand that, as a doctor, he finds himself at the heart of the problems engendered by the conflicts. Historical sequences enable the viewer to understand the origins of the war, what is at stake, and the consequences of these various aspects on the life and commitment of Dr. Mukwege. When, exceptionally, Dr. Mukwege leaves the hospital enclosure (to attend a meeting on the outside), we observe the vigilance that surrounds such an enterprise: the watchful bodyguard, different cars for the outward and inward legs of the journey, etc. 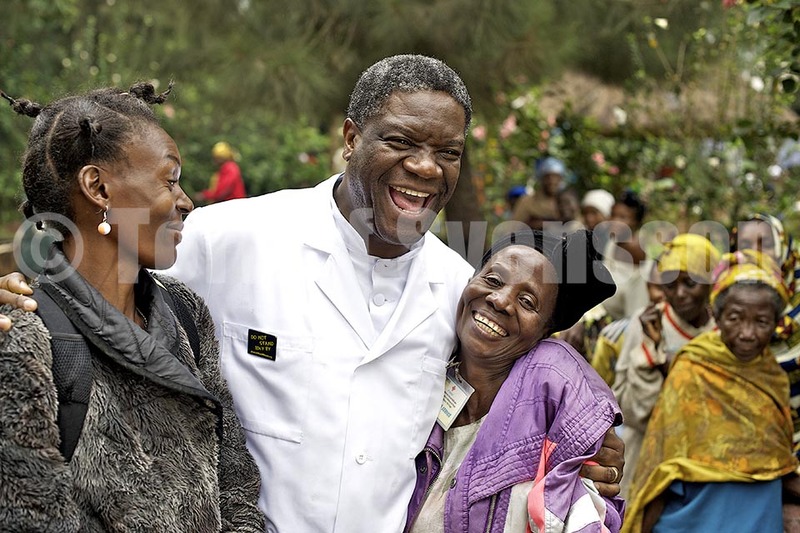 We also follow Dr. Mukwege during trips abroad for his appeals and searches for funding. Denis Mukwege is also a manager, a lobbyist and a spokesperson for civil society.